How easy is it to conjure memories of your favorite ABC books? From Animalia to Chicka Chicka Boom Boom, most of us have room for a few great ones in our homes. Just because a child knows the alphabet, however, is no reason to abandon the genre. After children graduate from simple books such as the delightfully rhymed LMNO Peas, other adventures await them. The visual, linguistic, and conceptual variety of these books continues to expand, thereby increasing their appeal to older children hungry for facts and striking images. The sampling below demonstrates the array of treasures that beckon. 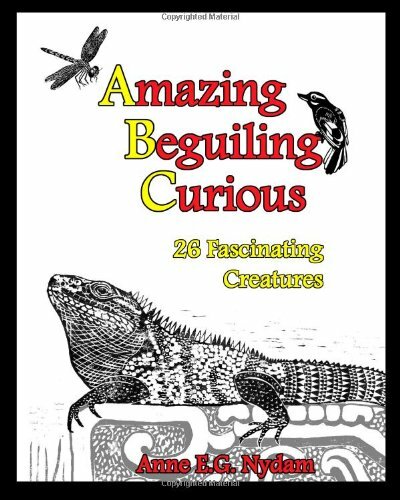 Nydam, Anne E. G. Amazing, Beguiling, Curious: 26 Fascinating Creatures. CreateSpace, 2010. Children who love animals will find much to enjoy in this attractive, informative alphabet book. Selecting 26 animals from around the world — from the armadillo to the hermit crab to the zebra — Nydam illustrates each with an intriguing block print that pleases the eye and invites a sense of wonder. Complementing each illustration is a page of several interesting facts and, finally, a well-chosen question that should inspire young ones to learn more. Examples of Nydam’s questions include “Why do sheep have so many molars? What are molars good for?” and “What kind of turtles or tortoises live near you? What are some differences between sea turtles and other kinds of turtles?” Teachers will appreciate the helpful notes on tools for further exploration: observation and research. She not only defines the two methods in simple terms, but gives clear and relevant tips on researching. One of my favorites is “Think about what you read! If you don’t understand something, keep looking for a clearer explanation.” Clearly, these are guidelines Nydam has adapted in the course of her years of teaching and parenting. Many curious children will no doubt want to learn more about animals but will also want to try their hand at making prints. Nydam has thought of that, too, and provides ideas and advice on techniques. Amazing, Beguiling, Curious: 26 Fascinating Creatures lends itself to wonderful curricular projects — or to just plain fun. My thanks to the author for providing a review copy. Gagliano, Eugene. 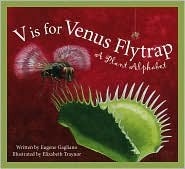 V is for Venus Flytrap: A Plant Alphabet . Sleeping Bear, 2009. Gagliano, a horticulturist, gives fascinating facts about the plant kingdom, including exotic species and their locations. In a child-friendly way, he also touches on plants’ role in a healthy lifestyle, how food crops fit into the global economy, and why conservation matters. 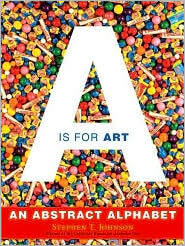 Johnson, Stephen T. A is for Art: An Abstract Alphabet. Simon & Schuster, 2008. This eye-popping book is a bit like an I-Spy book for the aesthetically inclined. Both adults and children will want to linger on the pages that yield dazzling, often unexpected images and colors . Also seek out Johnson’s Caldecott Honor winner, Alphabet City (1995). Raczka, Bob. 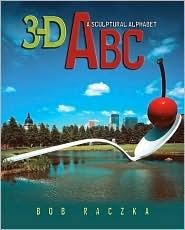 3-D ABC: A Sculptural Alphabet. First Avenue, 2007. Raczka features Twentieth-century sculpture, from the A shaped like an arrow to the Z in zig-zag form. He introduces readers to various styles of sculpture such as abstract, kinetic, and relief, and highlights the materials sculptors use. Schroeder, Alan. 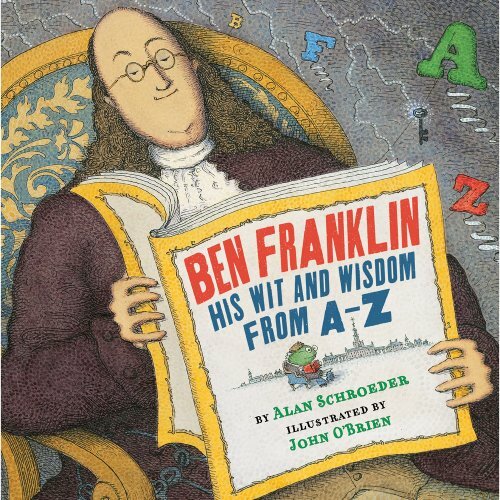 Ben Franklin: His Wit and Wisdom From A to Z. illus. by J ohn O’Brien. Holliday House, 2011. The author cleverly employs the format of an almanac in this amusing book spanning Ben Franklin’s amazing discoveries. Ziefert, Harriet. Lights on Broadway: A Theatrical Tour from A to Z. illus. by Elliot Kreloff. Blue Apple, 2009. Bravo for this book and CD sparkling with star-power and a full cast of facts. Theater fans will pore over the theatrical lore, as well as the clever illustrations. Enhancing the experience is a CD of Tony Award winner Brian Stokes Mitchell singing “I Was Here,” adapted from a song in the musical The Glorious Ones. These are great books. Picture books are my favorite. Thanks for the review. You’re welcome, Sharon. There are so many intriguing alphabet books, I could have gone on and on.